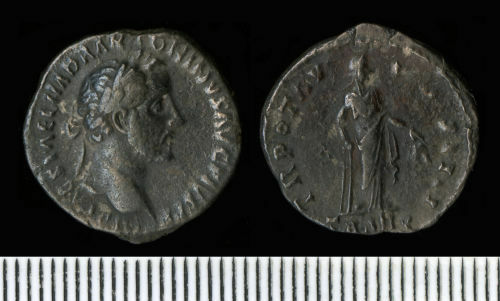 A silver denarius of Antoninus Pius dating to the period AD 151 to 152 (Reece period 7). TR POT XV COS IIII TRANQ reverse type depicting Tranquilitas standing right holding rudder on globe and cornucopiae. Mint of Rome. RIC III p. 52, no. 218.